Fritsch, Ahasver (ed.). 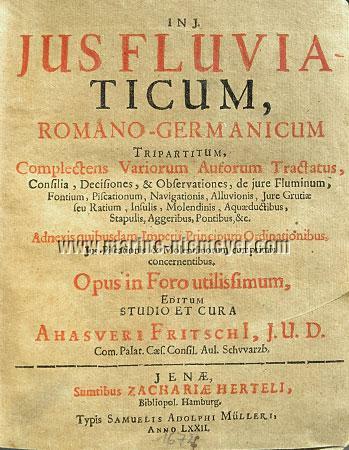 Jus Fluviaticum, Romano-Germanicum Tripartitum, Complectens Variorum Autorum Tractatus, Consilia, Decisiones, & Observationes, de jure Fluminum, Fontium, Piscationum, Navigationis, Alluvionis, Jure Grutiæ seu Ratium, Insulis, Molendinis, Aquæductibus, Stapulis, Aggeribus, Pontibus, etc. Jena, Zacharias Hertel , also bookseller in Hamburg , printed by Samuel Adolph Müller, (16)72. Sm. 4to. 8 unpag. ll. title, dedication, preface + index, 1264 (wrong 1260), 216, 112 pp., 8 unnum. ll. index. With some borders and large as well as several small initials and printer’s mark in woodcut. Contemp. vellum with old written inscription D. Fritschii / Jus Fluviaticum on the back. Paled red edges. Stintzing-L. III/1, 42 + Noten 25; Mantel II, 479; Jöcher II, 776. – Title in red + black. – With Müller’s fine printers’s mark on page III/112: laurel wreath with eagle to the left over two serpents, between the latter the monogram S. A. M., and in the inner circle MIHI DANTE DEO NIL NOCET INVIDIA. * EN! 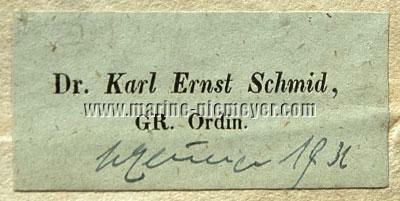 Dr. Karl Ernst Schmid, GR. Ord. 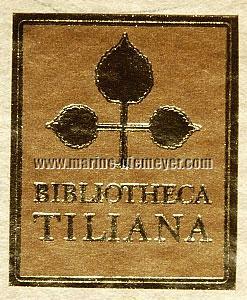 its small library stamp additionally on the back of the title and final leaf before the index (III, 112). – Evenly weakly to only partially somewhat more/severer browned as quite normal due to the paper, the eight index leaves additionally with touch of dirt as well as with faint tidemark in the white upper margin from their fourth page on. – A tear in the joint of the title (4 cm) backed acid-freely as a precaution. Small hole in the white top margin of l. 207/08, small paper tear out in the white lower margin and its outer corner resp. of ll. 675/6 + 1191/2, at least the latter originally. One such added from old in the dedication and 2nd index leaf. Pp. 1-24 with tiny to small ink spot in the outmost white upper margin. – All in all fine copy. II: Variorum Auctorum Consilia, Decisiones & Observationes. III: Imperii Principum Ordinationes, Jus fluminum, piscationem & molendinorum. Rhine – Danube – Main – Weser & Elbe . Georg Adam Struve (Magdeburg 1619 – Jena 1692, of an old Brunswick family with Berthold S. as archiepiscopal councillor + mill steward in Magdeburg as father, while among the ancestors of the mother Brunner “there were several renowned jurists; especially her greatgrandfather B. was held in great esteem as assessor of the Reich’s Supreme Court at Speier …”. Struve himself, president of the law college Jena, “Important as statesman and teacher … in the field of legal literature almost an outstanding appearance … a personality in which the leading thoughts of the time are embodied … Stintzing notes … ‘His papers are the first theoretical works in which the empiric method, the unbiased perception and organization of reality as goal of the jurisprudence begin to tell. He has established clarity about the foundations of the German conditions of law’ … ”, ADB XXXVI, 677 ff. ; Jöcher IV, 894 ff.) or Georg Sigismund Richter (Nuremberg 1645 – 1711, eldest son of the jurist Johann Georg, 1676 legal doctorate in Jena, 1685 envoy for Nuremberg on the Reichstag at Regensburg, since 1700 adviser of the council in Nuremberg, since 1704 Privy Councillor of the elector of Palatinate-Neuburg, 1706 as director of the Neuburg Privy Council in Dusseldorf, Jöcher X, 2072 f.), De Aquæductibus (1159-1222). – On the contents with Struve as author, the text preliminaries with Richter (Dissertatio de … Auct. Georg. Sigism. Richter.). For both the title is ascertained: for the former per Jöcher IV (1751), 896, top, with express (contents sheet only?) reference to the one here (“de aquæ ductibus, which disputation one also finds in Ahasv. Fritschens jure fluviatico”), for the latter per same place X, 2073, 2 (“D. de aquæductibus”). / Johann Hering (Oldenburg 1599 – Hanover 1658; 1629 syndic of the chapter of the Bremen cathedral, 1639 in same position in Verden, 1651 again so in Bremen where he had returned already in 1646. In-between, 1632, Oldenburg privy and chancellory councillor, in the 2nd half of the ’40s privy councillor “by nature” of the counts of Oldenburg and also after 1651 again in Oldenburg), Summa Quæstionum de Molendinis (1223-1231, Jöcher II, 1531 mentioning the title). / A. Fritsch, De Jure Pontium, Brücken=Recht (in mixed language, 1231-1260). Henning Göde (also Gode or, as here, Goden, mid 15th century – 1521, jurist from Werben near Havelberg, studies, doctorate + practice in Erfurt, “gained great prestige as solicitor (already early on) … also in other towns, especially of North Germany, with princes and gentlemen a requested legal counsellor and agent … at the Reichstag and state parliaments … From the council of the Erfurt municipality he received a salary as legal adviser, his reputation with that was so outweighing that nothing was done without his consent … The Erfurt university repeatedly elected its famous member for rectorship … The legal works handed down to us … are distinguished by clarity and shortness, they reveal the sense governed by reality … and his great talent for the legal practice …”, ADB IX, 314 ff. ), De Jure aquæ in nostro fundo ortæ (2-34). 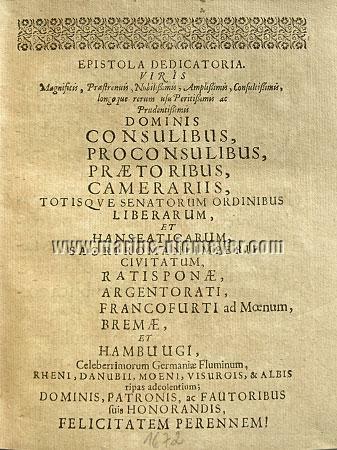 / Thomas Merckelbach, Der Jure Piscandi, obstruendialveum, derivatione fluminum, irrigatione pratorum, restagnatione, jurisdictione ac pietate aquarum (predominantly in German, 34-56, before in Kaspar Klock’s Consilia, 1649/50, vol. I, cons. 33; concerning, with reference to mills, too, fishing issues in the district of Ulm dating back to about 1496 with the keywords Rusbach, Schemmerberg, Obersulmetingen). / Modestinus Pistoris (Leipsic 1516 – 1565; “In the history of German jurisprudence the family Pistoris is entitled to a remarkable place. Together with legislation, the constitutiones Saxonicae, the Saxon jurists of the later 16th and the 17th century have exercised a noticeable influence on doctrine and jurisdiction not just in the own country, but in a larger part of Germany, too. Simon P. with his sons Modestinus and Hartmann belongs to the most renown among these scholars”, ADB XXVI, 186 ff. ), De Jure Piscandi præscriptione adquisiti probatione … (predominantly in German, 57-70; before in vol. I, 1586, cons. 19, of his father’s expert opinions posthumously published by the son Jacob). / Mathäus Wesenbeck (Antwerp 1531 – Wittenberg 1586), De Molendini & Aquæ Jure, jurisdictione, & similibus servitutibus (71-104, before Wesenbeck IV, cons. 197). / Th. Merckelbach, In causa Mayntz, contra Hanau, das Marck=Schiff auff den Meyen=Strom betreffend (quite well interspersed with German, 105-116, before Klock I, cons. 5). / Hieronymus Schurff (St. Gallen 1481 – Frankfort/Oder 1554 with reference to Wittenberg), Utrum habenti jus piscandi in flumine publico, possint definiti certa instrumenta, quibus utatur? (116-120, 18th of his Consilii). / Johann Biedenbach, Ob ein Fürst in Haupt=Flüssen, Rhein, Tonau, Necker etc. so durch deren vom Adel Oberkeit und Güter lauffen und fliessen, sich der Lands=Fürstlichen Obrigkeit anzunehmen habe? (Latin, 120-122). 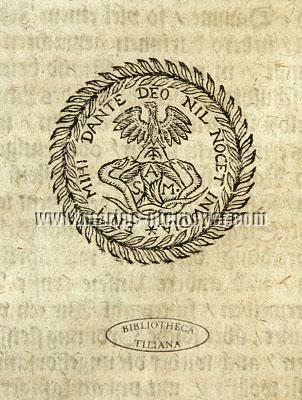 / De Fluminibus & jure prohibendi navigationem (predominantly in German, 122-145, before Consil. Argentor. – Straßburg – II, cons. 62). / Andreas Rauchbar., An Princeps, ad quem flumina publica regalium jure pertinent, navigationem in iis interdicere, & prohibere possit? (146-152, Rauchbar. I, quæst. 23). / Peter Heige (Stralsund 1559 – Dresden 1599), An de aquis & fluminibus investitus, fluviatica incrementa … (152-184, Heig II, quæst. 40). / N. Myler, Si flumen vel stagnum, cursum suum vel alveum mutet: … (184-195, Myler, Metrolog., chap. 14, § 21 ff.). / David Mevius (1609 Greifswald 1670), An in causis reparationis aggerum, Teich=Sachen, appellationi locus sit … (195-197, Mevius III, decis. 163). / Derselbe, An Processus in causis aggerum summarius … (197-199, same place dec. 164). / Fr. Stypmann, De Jure Stapularum & Geranii (199-207, pt. III, chap. 2 of his De jure maritimo & nautico as above. / Matth. Coler, De Poenis eorum, qui aggeres rumpunt (207, Coler., decis. 171). / N. Meurer, De Aquis & Piscatione (207-216, Meurer, Opera Venet. VII, art. 89). Churfürstliche Sächsische Fisch=Ordnung Johann Georg’s, Dresden July 29, 1657 (2-12) / Extract Churfürstl. Sächs. Landes=Ordnung de Anno 155(5? ), Fisch=Ordnung (12-13) / Fürstl. Sächs.-Gothanische Fisch=Ordnung de Anno 1667 (13-18) / Fürstl. Bayr. Fisch=Ordnung. Wie die auff der Thonau, Ihn, Yser, Saltzach und sonsten allenthalben gehalten werden soll (18-29) / Fürstl. Sächsische Merseburgische Fisch=Ordnung Herzog Christian’s, Merseburg February 9, 1670 (29-38) / Fürstl. Hessen=Casselische Wasser= und Fisch=Ordnung Landgraf Wilhelm’s, Kassel May 1, 1657 (38-43) / Churfürstl. Sächs. Wasser= und Mühl=Ordnung Auff dem Unstrut=Strohm Johann Georg’s, Dresden April 29, 1653 (44-53) / Fürstl. Sächs. Gothanische Mühl=Ordnung (53-61) / Fürstl. Bayer. Ordnung des Mühlwercks (53-70) / Fürstl. Sächs. Merseburg. Wasser= und Mühl=Ordnung Herzog Christian’s, Merseburg, February 8, 1670 (71-78) / Teich=Ordnung. Hertzogs Augusti (of Saxony, Jülich, Cleve and Berg etc. ), Postulirten Administratoris des Primat= und Ertzstiffts Magdeburg etc. Erneuerte und Publicirte Verordnung, Wie es hinführo mit wieder Anbauung der Elb Teich=Dämme im Jerichauischen Creyß gehalten, und was darbey allerdings beobachtet werden soll. Halle June 11, 1655 (79-112). – All in German. of the time pure and simple and still 345 years later a fund of sources of together culture-historical comunicativeness. In addition recognizably rarer compared with his other today still irrenounceable Corpus juris venatorio-forestalis with its editions of 1676 + 1702.
in the Thuringian, as besides Fritsch’s district, as the origin of both – still 1840 Schmid was constitutional-reformatively active for Schwarzburg-Sondershausen in whose princely archive Lindner, born 66 years later in Sondershausen, processed as 17-year-old the hunting files – , in the Franconian as sphere of activity of Schmid for 10 years (Bayreuth) and as afterwar result lifelong for Lindner (Bamberg) resp. and publicist (i. a. editing of the Baireuth political newspaper, 1797-1807, Germany’s Rebirth, 1814, Civil Rights of the Jews, 1816, Book Reprint, 1823, then important contributions for Brockhaus’ “Hermes” whose editing he took over in 1823), so Lindner industrialist and publishing scholar. Whose after-life is founded in the activity as the latter and therefore in his 12000-volume library. Which as object is past, but shines up for all times, however, from the collector’s “Bibliography of German and Netherlandish Hunting Literature from 1480 till 1850” from 1976 together with the continuation till 1945 by the collaborator of long Sigrid Schwenk (published vol. I: A-K, 1997). with provenance Karl Ernst Schmid with its exlibris of the rising branch “with three stylized lime leafs, on brown ground and printed in shining gold, – a ‘tilia aurea’ – ” as a link to one of “the most fascinating collector personalities” (Markus Brandis) on the field of the hunt in the farest meaning.